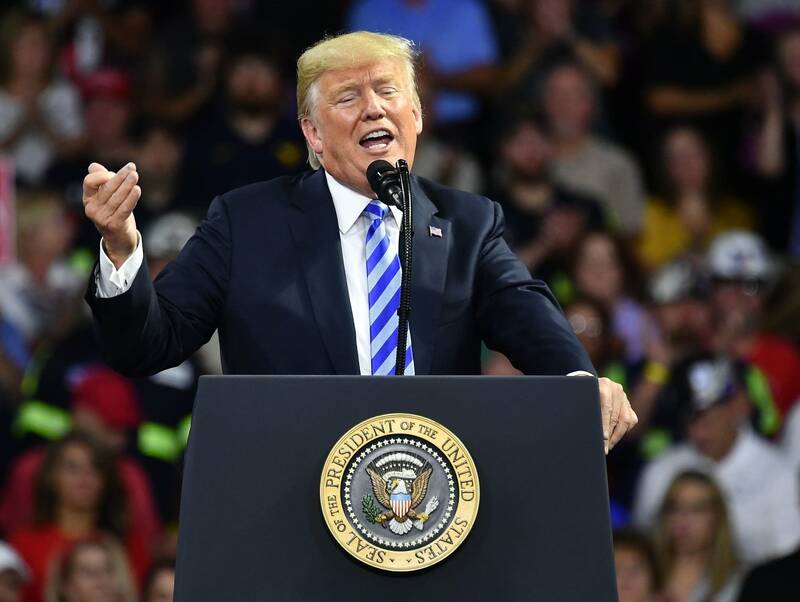 President Donald Trump is not on the ballot this year but seven in 10 Minnesotans said he will still be top of mind when they head to the voting booth Nov. 6. 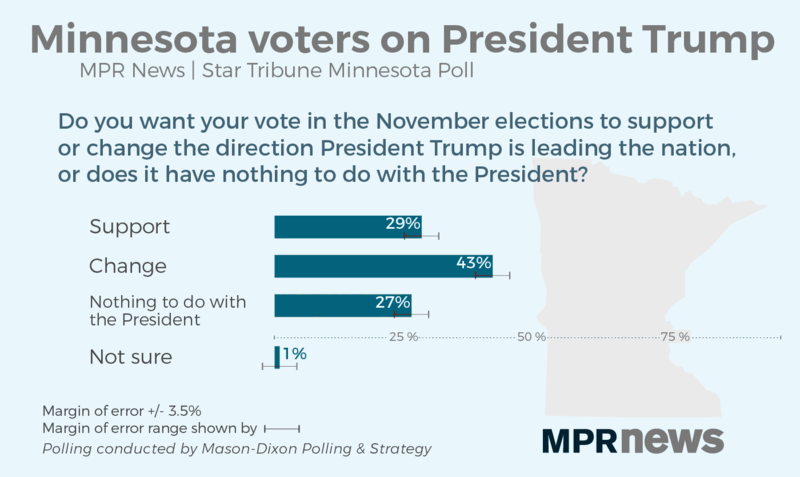 A survey of 800 likely voters in the MPR News/Star Tribune Minnesota Poll found 43 percent want their vote in the 2018 midterm election to change the direction that Trump is leading the nation, while 29 percent want their vote to support Trump. Twenty-seven percent said their vote in November doesn't have much to do with Trump, while only 1 percent of respondents said they were not sure. A majority of younger, metro-area voters said they are motivated to vote against the direction of the president. Sixty-one percent of 18 to 34-year-olds said their vote this fall is to support a change of direction in the nation, as did 52 percent of people from Hennepin and Ramsey counties, the state's two most populous counties. More women than men — 47 to 39 percent — want their vote to change the direction of the president. Kelly Martinson of St. Paul is among respondents who want a change, and she doesn't mince words when it comes to Trump. "I don't like President Trump, and I don't like the way he's doing his job," she said. Martinson, who works in educational publishing, is bothered by the president's policies, as well as his style. Her biggest beef is what she sees as Trump's difficulty with facts. "He has taken that and thrown it out the window, to the point where we can't even have rational conversations, which I think is a real injustice to what American democracy should be," she said. In central Minnesota, Richard Johnson of Onamia wants the president to have a chance to succeed. "He is our president," said Johnson, a self-described independent. "He was voted in, so I'm going to support him as much as possible." The numbers show stark political polarization over Trump. Of those polled, 74 percent of Republicans said their vote is to support the direction of the president, while 83 percent of Democrats said their vote this fall is for a change. Among independents, 18 percent said they intend to support Trump's leadership through their voting in November, while 38 percent want their votes to change the nation's direction, according to the poll. But 43 percent said their vote doesn't have much to with the president. 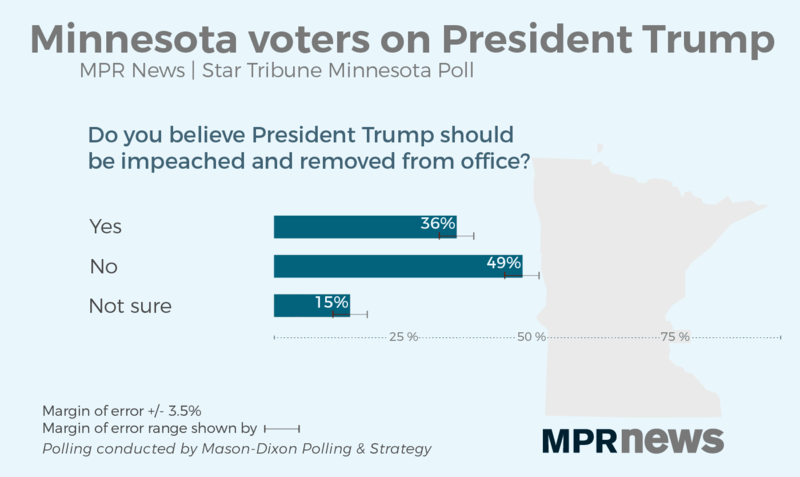 No matter how they feel about the president, Minnesotans generally are unenthusiastic about the possibility of him being removed from office. The poll results show 36 percent said Trump should be impeached, but 49 percent of respondents said he should not. Fifteen percent were not sure. In southwestern Minnesota, Loretta Parker of Marshall is among those sympathetic to Trump. "I think he's trying his hardest," she said. "I don't think he should be impeached." Kathryn Pearson, an associate professor of political science at the University of Minnesota, said there would probably be more Democrats supporting impeachment if party leaders and candidates were talking about it more. "The Democrats are not running on a message of impeachment. That could really backfire," she said. "I think 67 percent of Democrats do think the president should be impeached. But I think it would be higher if Democratic candidates were campaigning on that message, and for the most part they really are just avoiding that message." 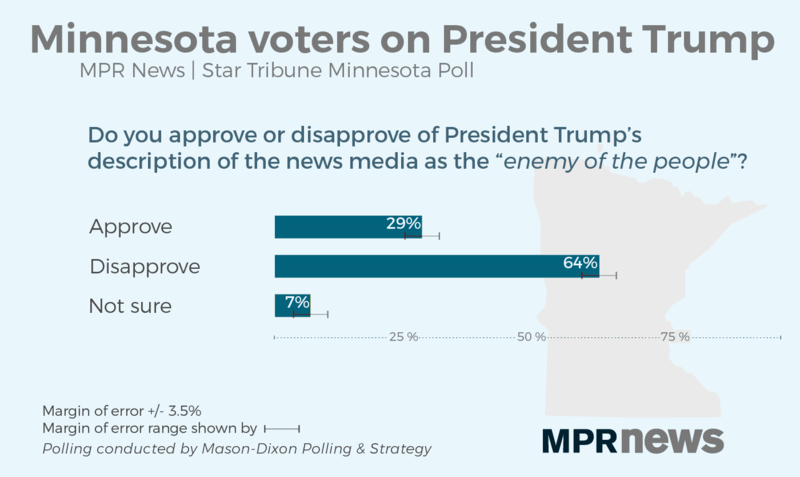 Poll participants were also asked about President Trump's description of the news media as "the enemy of the people." Overall, 29 percent approve of the description and 64 percent are opposed. Pearson said she was surprised by the numbers. "That's still a lot of people suggesting that the press is the enemy of the people," she said. "I don't think we would have seen that absent the president's cues. I think survey results on that question would look a lot different a couple years ago." Again, the results are highly partisan. Only 4 percent of Democrats approve of the "enemy of the people" description, while 68 percent of Republicans approve. Trump's presidency has been frequently overshadowed by the ongoing investigation led by Special Counsel Robert Mueller into possible collusion with Russia. 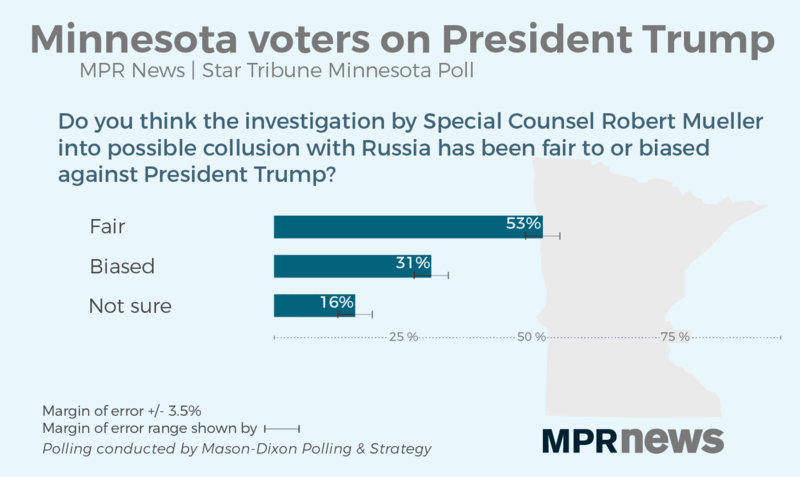 Among poll respondents, 53 percent believe the investigation has been fair, 31 percent believe it has been biased against the president and 16 percent are not sure. The concern falls along party lines, with 71 percent of Republicans saying the probe is biased compared to just 4 percent of Democrats.